Battersea Borough Council held their first meeting since the outbreak of war on 9th September. In fact, two special meetings were convened for that evening, the first was to deal with reports from the Committees and the second to consider the war. The Committees were largely reporting on schemes of works to do with the Central (Unemployed) Body, which was a London wide body set up to help create jobs – work on the Latchmere Estate was done using labour via the Central (Unemployed) Body, and one of the schemes agreed at this meeting was to finish laying out the Latchmere recreation ground. Another scheme agreed was the building of a Municipal Rifle Range – why or where is not given. The Mayor reported that he had been asked by the Lord Mayor of London to call a Town’s Meeting on the events leading to the war and to urge recruitment, he had also been approached by the Colonel-Commandant of the 23rd County of London Battalion to help in assisting recruits. The day after the Council meeting that Town Meeting was called for 18th September, the Council having agreed to grant the free use of the Town Hall for it. Several Council employees had obviously already been called up, as it was also discussed how they ought to be paid whilst on active service. The Council agreed that every facility should be given to those who wished to join, and that they ought to be paid the difference between their Forces salary and their Council salary, with the job kept open for them to return. The second Council meeting of the evening duly considered their position on the war, and referred all matters to the relevant Committees. The minutes do not go into detail about their considerations, but fortunately the South Western Star was present at the meeting and can supply more information! Thirty-eight Council employees had either been called up or enlisted, and several Councillors expressed the hope that more would volunteer. Another Councillor took this to mean that the Council should not employ any able-bodied men young enough for active service, and argued strongly against that position and in favour of ensuring that no soldier’s family would have financial difficulties. There was a lot of concern about the National Relief Fund and especially over the fact it did not benefit civilians – a local scheme ought to benefit all those locally in distress. Councillor Raynor said that all money given was for the relief of all distress, and that any employer saying to an unmarried man “if you don’t enlist I’ll sack you” was contemptible, then asked why it was that only workmen’s sons were forced into the army. That comment, not recorded in the minutes, caused outcry amongst members and the gallery, and another Councillor accused him of raving. The Council then referred the matter of paying any of their employees who joined the Forces to the Finance Committee. How best to pay Council staff will be discussed a lot in future. This photograph shows Wandsworth before the war – the building was the Town Hall on Wandsworth High Street, which was re-built in the 1930s. The first meeting of Wandsworth Borough Council after the outbreak of war was on 12 August 1914, and it seems to have been convened specially. Two councillors were reported as having been called up for active service – Cllr M H Anderson RN and Cllr Major R F L Turner. (Lieutenant Maxwell Henry Anderson lived in Streatham Park, and Major Robert Frederick Lewis Turner in Southfields). The first actions the Council took relating to the war both concerned helping those in difficulties. The Prince of Wales National Relief Fund had been swiftly set up to help those in financial hardship because of the war and Wandsworth agreed to contribute £2000 to this. Using the value of money in 1910 as a guide, this would be about £114,120.00 today. The Council also responded to a request from the Local Government Board and formed a committee to prevent and relieve financial distress caused by war in the local area. The only committee report at the meeting was from the General Purposes Committee – reporting on the early effects of war – the Committee had to report that the Medical Officer of Health had been called up for duties with the Territorial Force, as had several other members of staff, and that alternative arrangements were being made. The necessary leave was granted and instructions were made to pay these men half wages – an issue which will come up again in the future. The Committee also reported on the suggestion that schemes should be set up to help with the probable lack of work the War was likely to cause. Several schemes were proposed, including embankments at Southfield Slop Shoot and Bell Lane Wharf, development of Putney Vale Cemetery and sifting material at Garratt Park and Lonesome Shoots. 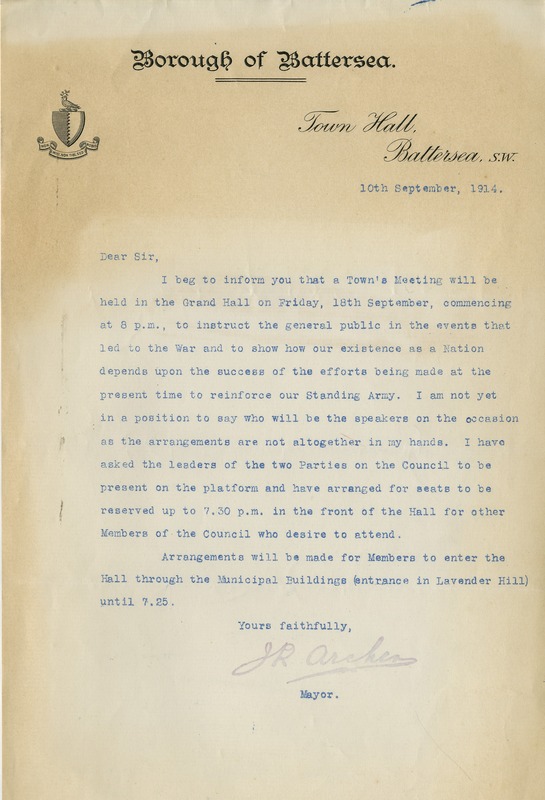 Further reports included that the Town Hall was to be used for the enrolment of special constables, for local representatives of the Soldiers’ and Sailors’ Family Association and for an Army Recruiting Depot. The borough was clearly prepared to help the burgeoning war effort. Wandsworth Borough Council minutes, 1914. 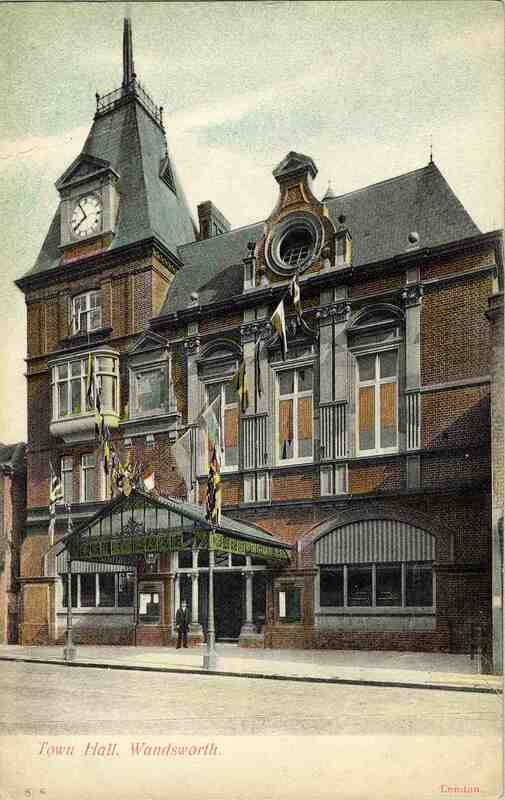 Postcard – Wandsworth Town Hall, c1911. The War. Battersea and Wandsworth have thought of little else this week… there was a notable absence of hilarity. Boisterous enjoyment did not exist. The shadow of war clouds was over everything, and everywhere in or near ton as seen the strange spectacle of holiday crowds, studying with anxiety and concern the hourly editions of the evening papers. Despite the area thinking “of little else”, the outbreak of war was only covered by one page of Battersea’s local paper, the South Western Star. The rest of the paper covered the usual round-up of the local Police Court and Inquests, local news stories and adverts. The week since the last issue had included a Bank Holiday, where the usual day-trips were complicated by the South Western Railway Company having cancelled all holiday arrangements – meaning that many of those who were planning to go away from Clapham Junction caught the Southern Railway to Brighton instead and led to record numbers of passengers. Buses were packed, the commons and parks were crowded, but the paper reported less of a holiday atmosphere and increased worry about the war. Before the bank holiday, mobilisation of troops had been expected and the officers and men of the 23rd Battalion County of London regiment had worked into the night getting their headquarters on St Johns Hill ready for the anticipated order. The battalion were due to go to camp at Salisbury and marched to the station, only to be ordered to return as they reached Acton. More men arrived at headquarters throughout Monday, and about 50 men actually joined the battalion. Crowds started to gather to watch what was happening and waited silently all day, with only a single policeman required to keep them in order, until the order finally came in the evening. Tuesday was much the same, the declaration of war was made public at the Junction after midnight and was “received with repeated cheers”, according to the South Western Star. By Wednesday morning crowds had again gather anticipating that the battalion would march out – although by the time the newspaper went to press this had yet to happen. Elsewhere in the area the announcement of war was causing worry. Throughout Tuesday there was a rush of panic buying, and shops were crowded with anxious customers. Many shop-owners stopped taking orders on credit, and sugar, cereals and non-perishable material started to sell out. Apparently there was a general reluctance to accept cheques, payment had to be made in cash only and as the banks had been closed on Monday there started to be a shortage of coins. Pawn-brokers did a roaring trade on Monday and Tuesday as people tried to raise cash to be able to go shopping. Some shops apparently raised prices on Tuesday, not once but three times. Others were more sympathetic to their customers and refused to let purchasers take the entire stock of certain items to ensure that there was enough for everyone. A regular overheard remark was “It’s only beginning. God knows what it’s going to be like”. The South Western Star and other local papers are available on microfilm at Wandsworth Heritage Service.